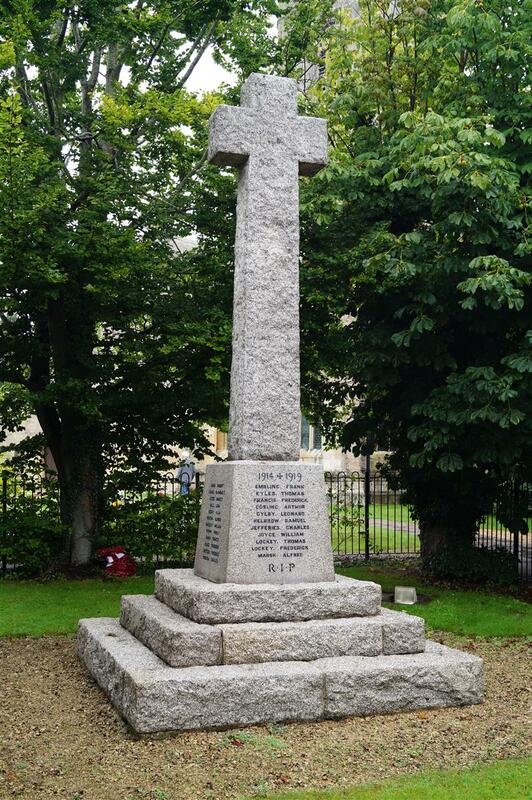 Lambourn War Memorial – Dedication Service, 17 Dec 1920. The long anticipated dedication of the war memorial took place on Sunday afternoon. For half an hour and more previous to the hour fixed for the service, people from all over a wide area poured in the Parish Church. All the available sittings were quickly crowded, but still the stream of worshippers continued without cessation, until all the standing room was occupied. It is computed that at least a thousand folk were present. Half as many more thronged the precincts. At 2.45 a strong muster of ex-Service men were paraded in the Market Place by Major Jones to the number of about four score. As they marched off to take up their allotted places in the nave of the church, additions swelled their numbers to close on a hundred. The relatives of the commemorated men occupied a block of seats near the tower. Up till the time set for the commencement the Organist played music appropriate to the occasion, concluding with an impressive rendering of Chopin’s Funeral March. So that everyone should be able to follow the proceedings without any difficulty, each person as they entered the Church was presented with a copy of the ‘Form of Service’, compiled by the Vicar. The Rev R Bagnall. This, a model of its kind, had been most beautifully printed, and will be treasured by all who were so fortunate as to secure an impression as a fitting memento of a most memorable occasion. General Rennie then loosed the cord which held the Flag of St George and the Union Jack in position, and the Cross stood revealed. The Vicar thereupon read the Dedicatory Prayer and the choir and people sang: “On the Resurrection morning.” After the Blessing the ex-Service me came smartly to attention, and Corporal Wicks sounded the Last Post. In conclusion a verse of the National Anthem was sung. Then one of the smallest choristers, by name Charlie Hutchins, deposited a sheaf of lovely red and white chrysanthemums at the foot of the Cross from the Vicar and Choir in remembrance of the Boys of St Michael’s Choir who went forth and came not again. Next the ex Service Men offered their tribute at the hands of poor blinded Percy Heath, who was guided by two comrades. After him came Captain Butler with a beautiful wreath from the Football Club; Sergeant Pinfield with a broken column exquisitely wrought in white chrysatnemums, the offering of the Tennis Club. Not less touching was the evergreen cross fashioned by the Boy Scouts. There were, in addition, many wreaths and floral emblems deposited by relatives of the heroic dead. Reynolds, Frederick Wing, Charles A.